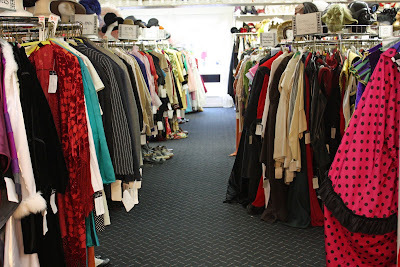 A peek inside The Costume Shop on Chinden. I had to pop inside with my daughter yesterday. She "needed" a cupid's bow and arrow....and all she had to do was ask one of the employees and it was immediately delivered to her. My 8-yr. old says we "definitely" have to go back when we have more time so she can do "proper exploring." It was a popular place yesterday for folks getting ready for Mardi Gras parties next week. And nothing for the Boise Diva? I think they have (or used to have) party trunks that you can rent for kids. They are themed so the kids can have lots of fun being pirates or princesses, etc..